Thousands of gifts and hundreds of tonnes of essential goods have been prepared for soldiers and people in the Truong Sa (Spratly) archipelago on the occasion of the upcoming Lunar New Year (Tet) festival. According to a report of Brigade 146 under the Naval Zone 4, besides gift prepared by the Defence Ministry and the Naval Zone 4, the Fund for Truong Sa – Hoang Sa donated 700 million VND, and the club Youth for Homeland Sea and Islands raised 150 million VND. 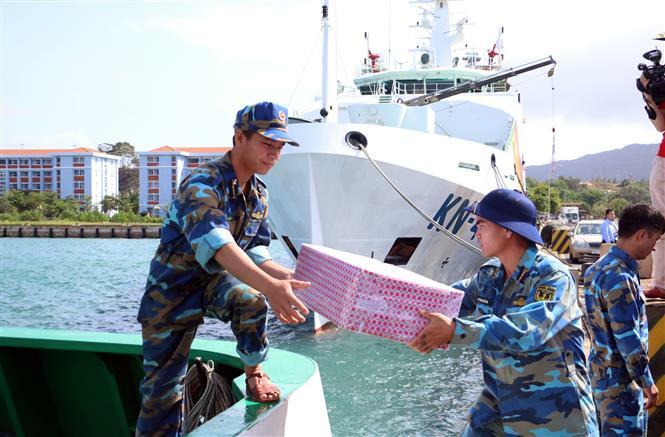 The central province of Khanh Hoa and many organisations and individuals contributed gifts, essential goods, rice and confectionary, to ensure that the soldiers and people on the islands can enjoy the year’s biggest traditional festival in style. Deputy Political Commissar of Brigade 146 Senior Lieutenant Colonel Luong Xuan Giap said the gifts reflect the warm feelings of people nationwide to Truong Sa and is a source of great encouragement for the soldiers and people, helping them fulfil the mission of protecting the fatherland’s sea and islands.